Yesterday we (my family and I) drove to Allentown, PA to go to the Da Vinci Science Center. 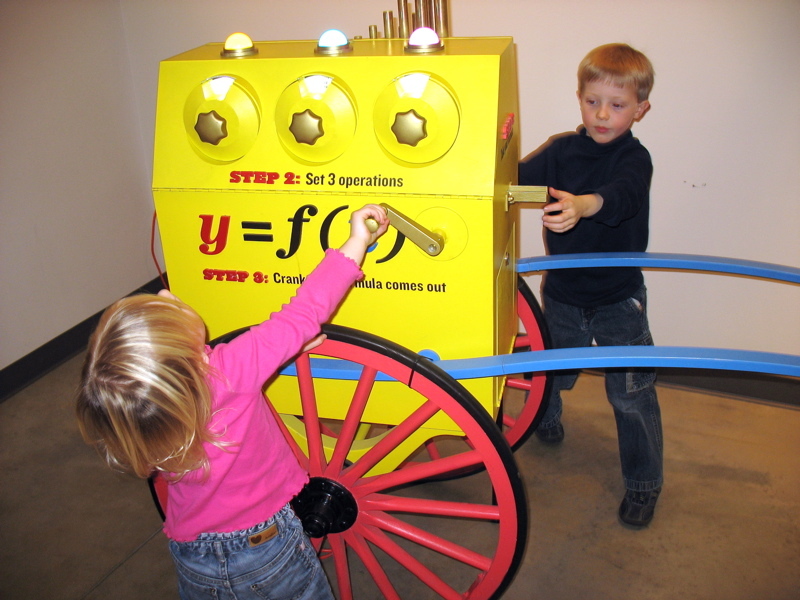 We’d never been there before, and would have been interested in going anyway, but the reason for going now is that they are hosting the Math Midway exhibit (until January 6, 2010). 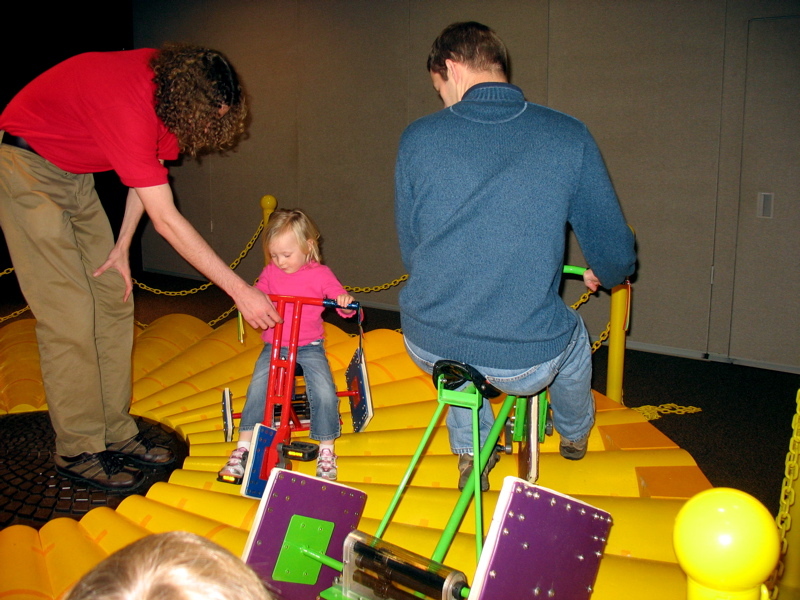 More specifically, my son and I wanted to ride the square wheel trikes (on petals of a sunflower made from catenary curves). I’ve been wanting to ride on such a bike since seeing Stan Wagon do it in the mid 90’s. In case you were wondering, the ride was quite smooth. The trikes’ handlebars were welded in place so that the they rode along the right path (which was marked on the floor). So as long as it was lined up right, it was a non-bumpy ride. My son did go a little too fast once and ended up “off the track.” Oh, and notice that because the sunflower petals get wider as they go out, the size of the outer squares are larger than the inner ones. 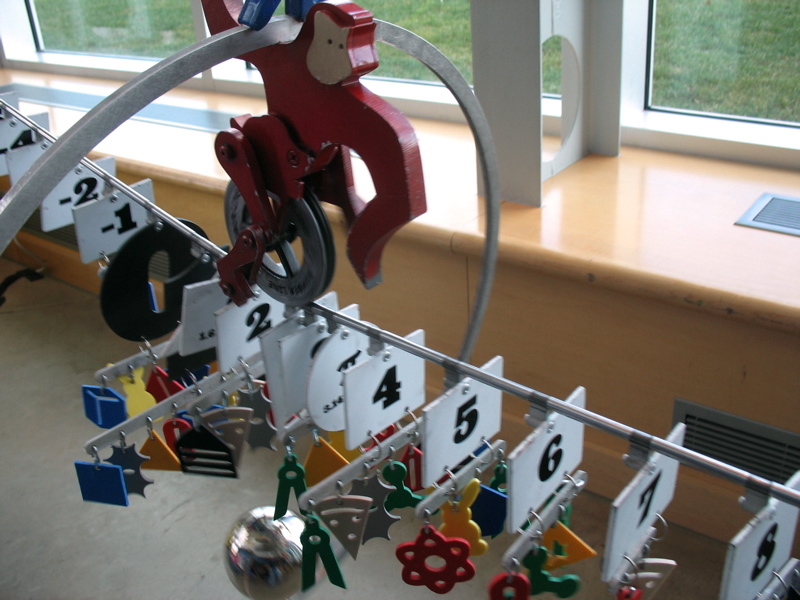 They had other neat mathematical exhibits, such as the musical function machine (which I’ll have to show my students, since I’m always drawing function machines): and a monkey that rides up and down a tight-rope real number line: You should be able to see e and π in the picture above. All of the dangly pendants mean something (the number is a prime, a Fibonacci number, a factorial, etc.). All-in-all it was a great exhibit. There was much more than what I’ve shown here, and it was the right balance of mathematically sound and entertaining to use. I’m glad to have gone. Most importantly, my kids had fun (and I got to ride the square-wheeled trike). I hope you can check it out when it comes to your neighborhood. Incidentally, the Math Midway is featured in the December 2009/January 2010 issue of MAA Focus. Just curious, when you rode the square trikes, was it bumpy (when the wheels round a corner) or smooth like a regular circle-wheeled trike? I might show these pictures to my students and ask them that question — would be an interesting intuitive thought experiment. That sounds fabulous! I looked for a schedule, and the only other site booked so far is in NYC. I wonder if I could encourage Lawrence Hall of Science (near me) to book this. 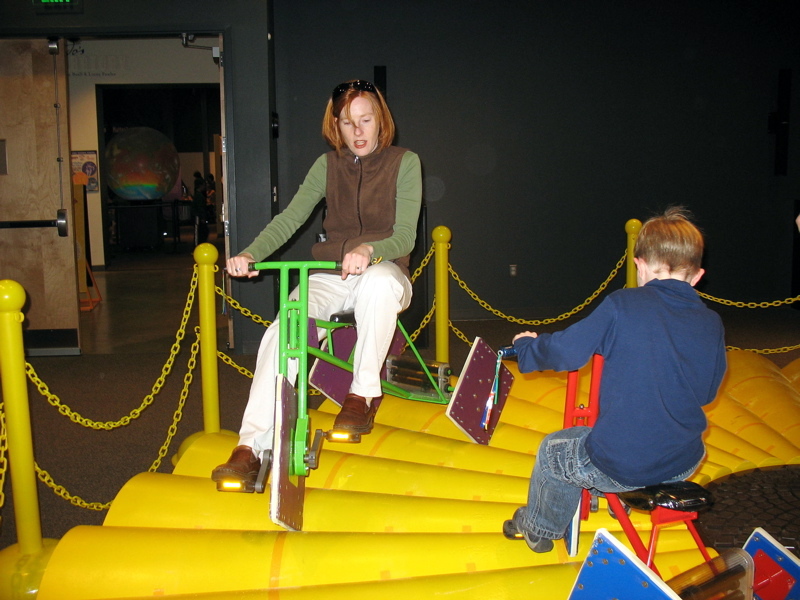 I rode one of those things as a kid at either COSI in Columbia, OH or the the Carnegie Science Center in Pittsburgh. 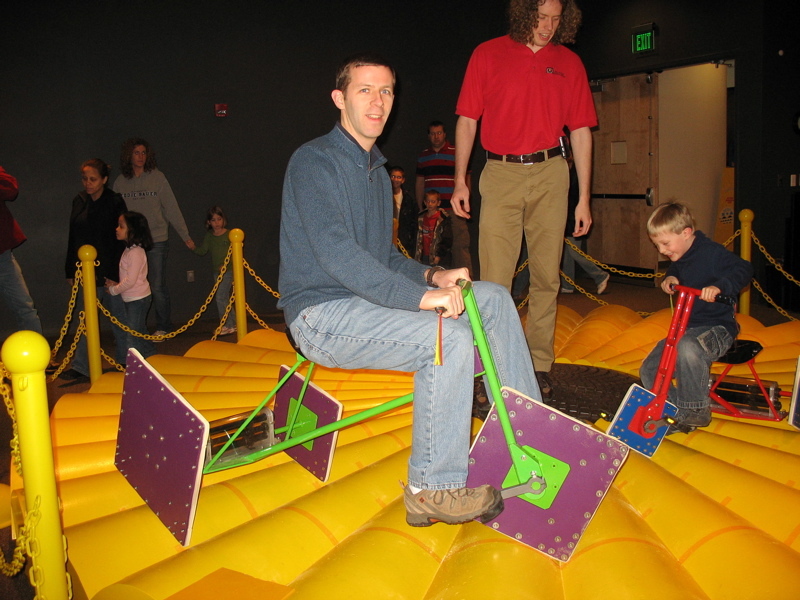 Apparently it was at the Carnegie Science Center at some point but I remember riding it at COSI. Traveling exhibit maybe? I found a picture of it.